Prospective graduate students: Graduate students can join my research group through the Entomology Department, the Evolution, Ecology, and Organismal Biology Graduate Program, or additional programs at UCR. Please send me your curriculum vitae, unofficial transcript(s), and a statement of your research interests that includes how they are complementary with the lab. Note that the application review process for fall admission to the Entomology Department can begin as early as December 1. ​I strongly encourage prospective students to apply for fellowships such as the National Science Foundation's Graduate Research Fellowship, and if your interests fit well with the lab I may be able to provide feedback on your application. Undergraduate students: If you are a student enrolled at UC Riverside or are enrolled at another university but would like to do research in the lab, please contact me directly to discuss potential opportunities. Prospective postdocs: Please contact me to discuss opportunities. International students, postdocs, and researchers: I am very interested in working with students and researchers from outside the US. If you are from Mexico, the University of California Institute for Mexico and the United States (UC MEXUS) program has some excellent funding options to support collaborative research at the graduate and postdoctoral levels in Mexico or at UCR. There are also funding options for students from Germany through the RISE program, for Israeli students and researchers through the Binational Agricultural Research and Development Fund, and many other options for supporting international research collaborations. ​Additional information: The Woodard lab was founded in summer 2015 as part of the Entomology Department at the University of California, Riverside (UCR). Our Department is home to a diverse group of faculty and students, with several labs in the Department working with native bees, ants, and/or wasps (see Links). UCR has many resources for research in agriculture, entomology, and genomics, including the Entomology Research Museum, Institute for Integrative Genome Biology, Department of Agricultural Operations, Agricultural Experiment Station, California Food and Agriculture Enterprise, Center for Conservation Biology, and the Insectary & Quarantine Facility. More broadly, as part of the UC system, we are affiliated with the Division of Agriculture and Natural Resources and the outstanding UC Natural Reserve System. Inclusivity statement: Our lab strongly believes in the inclusion of nontraditional, underrepresented, and marginalized groups in science and we warmly welcome individuals from all backgrounds, groups, and abilities. If you are interested in research but feel that there are obstacles preventing you from pursuing it, contact me and we can discuss potential strategies. 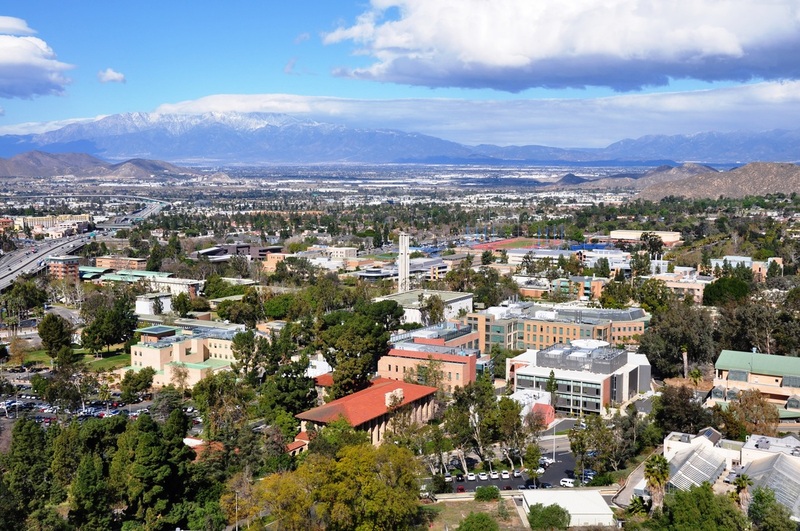 The UC Riverside campus and San Bernardino Mountains.